Measure yourself?, sure...why not? Although...it may be best to recruit the help of a pal. Also, we can't be as flexible with client-submitted remakes if your numbers are way off, so be ready to compromise and work with us if this happen, thanks. - (At this time, we're only accepting self-measuring for shirt orders). CLICK HERE for suit ordering info. *PRO TIP: Do three sets of measurements and submit the average. 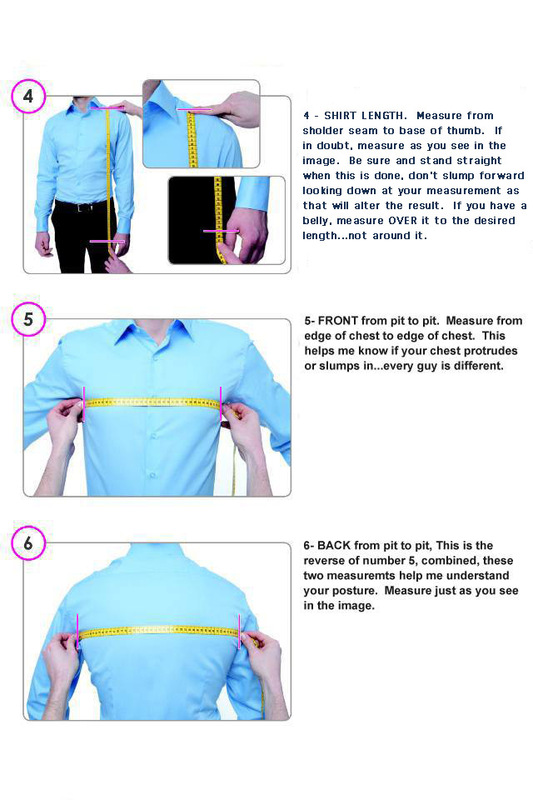 *PRO TIP: Stand comfortably while being measured...you know...as if you're wearing a shirt! You'll need a piece of paper, a pen/pencil/crayon and a fabric measuring tape (you can order an Amazon Prime one here). Please refer to the images below to assist you with your measurements. NOTE: If any box is left blank, we'll use the last measurement(s) we have on file for you. NOTE: Once you submit this form, it gets forwarded to us. We'll send you an email confirmation before cutting cloth! If you realize you made an error AFTER sending, please simply RESEND another form. About how long ago was your last order with us? Rough guess is fine... If your first time, enter First Time! 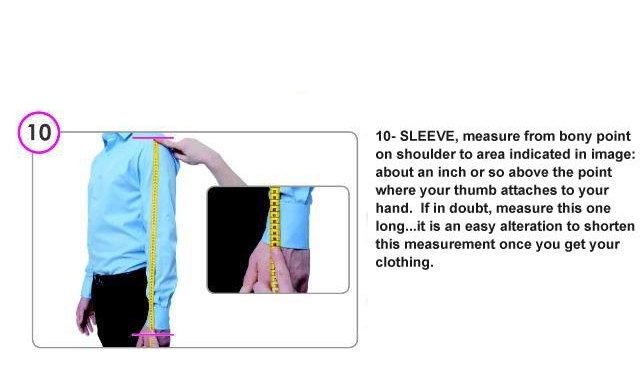 There's no photo for this one - simply measure around the base of the neck with a finger or two under the tape to ensure a comfortable fit.